Standing up for himself and others . . . .
Greetings, welcome and thanks for calling in at our brand new OM@home blog, a blog about children and young people, written for children and young people . . . .
Young people like Nadin Khoury . . . .
Nadin’s family fled Liberia 12 years ago, seeking a better life in the United States. Having seen some bad things in their homeland, they’d expected to be safe in Pennsylvania. Being bullied had not been in their plans. Sadly, heading for school one morning, that is what happened to Nadin. The teenager is not the first person to be bullied, nor will he be the last, but his actions thereafter should serve as a signpost for us all. You see, Nadin refused to take the easiest path, the one the bullies had marked out for him . . . . Instead, showing great courage, he stood tall and did the most difficult thing. Not just for his own sake, but thinking also about others. ‘Next time, maybe it could be someone smaller than me,’ he says. ‘Maybe next time, someone could really get hurt’. Nadin’s life has changed beyond recognition since he made his stand. You see, hearing about his pluck, his three favourite players from the NFL – Philadelphia Eagles stars DeSean and Jamaal Jackson and Todd Herremans – took time out from training to meet Nadin and congratulate him for being so brave. 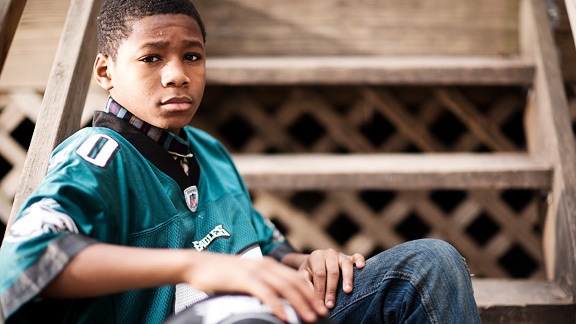 ‘Any time you ever need us, I [have] got two linemen here,’ DeSean told Nadin, before admitting that he too had experienced childhood bullying and that, with a 13-year-old brother called Desmond, the issue remains important to him. ‘He [Desmond] is a small guy too,’ he said. ‘Nadin reminded me of him. When I thought of kids doing that stuff to my little brother, man, that really got to me’. So much so that DeSean has started his own personal crusade against bullying . . . .
. . . . all because Nadin did the right thing. He has inspired others too, not least LaToro Yates, the director of admissions at Valley Forge Military Academy. Himself bullied as a child, LaToro heard that Nadin’s ambition is to become a US Marine and has arranged for the courageous teen to enrol as a VFMA cadet. Nadin should serve as an example to us all . . . .
To do the right thing, even though it is difficult . . . .
To think about the next person . . . .
To tell someone . . . .
Because teenager, NFL star or Marine, everyone has experienced bullying at some point and all are determined to do something about it. Being bullied? Please don’t suffer in silence. Speak up, tell an adult, do something about it. You’re not alone, there are people out there ready to help. Click here for further information. Tragedy, Trayvon and togetherness: it’s time to tighten the bonds of humanity….